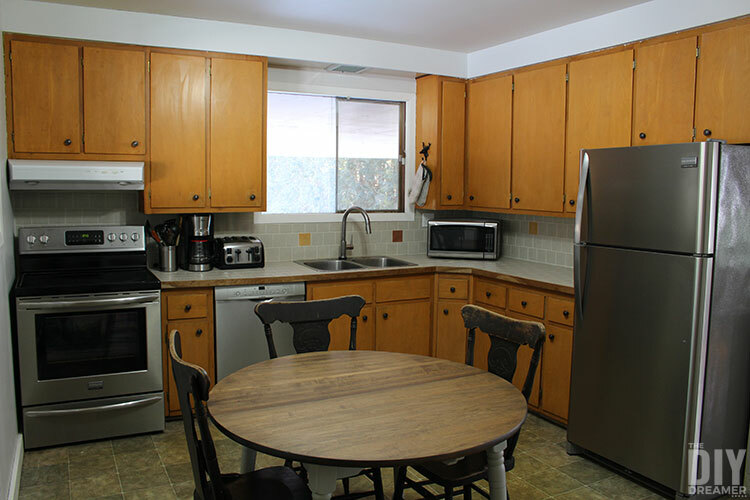 I have been sharing photos of my 1960’s kitchen with you for years. 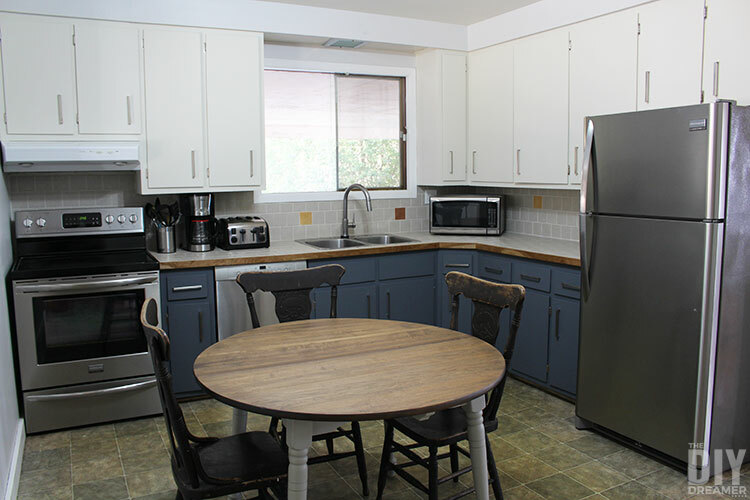 The last time I shared an update was when we decided to go with the approach of a kitchen makeover one step at a time. Since then we have changed all our appliances to stainless steel, except the range hood. We also changed our table, I shared it with you a few months ago. It was a table that belonged to my great-uncle. We painted and stained the table to suit our taste. My husband and I have been talking about changing our kitchen cabinets for years, but goodness is that ever expensive. With all the windows in our house that need to be changed, we just can’t bring ourselves to spend thousands to change the kitchen cabinets. With this month’s At Home DIY challenge being DIY Home Improvement, we decided it was the perfect time to tackle the kitchen cabinets! Just in case you are new here, I’m participating in a year long DIY challenge with some great DIY bloggers. Every month we have a new challenge. Last month’s was the Upcycle Thrift Store Challenge, I showed how to upcycle a frame into a headboard. At the bottom of this post you’ll find a bunch of DIY Home Improvement projects. 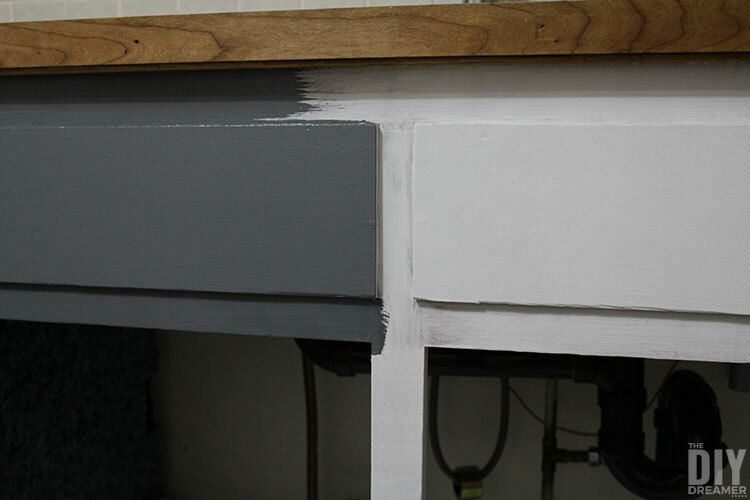 After brainstorming possibilities, we decided to paint the kitchen cabinets! Why not right? 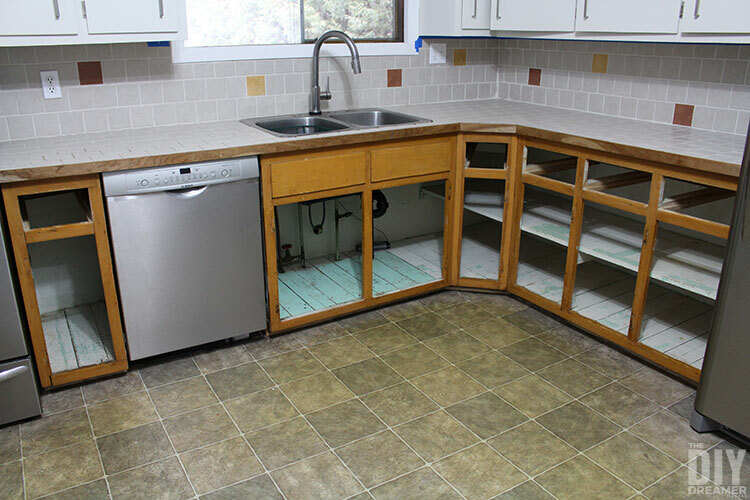 We have nothing to lose and we may just fall in love with our kitchen cabinets! Thank you to Fusion Mineral Paint for providing us with paint for this project. We are extremely grateful for their support and thrilled to help spread the word about their wonderful products. This posts contains some affiliate links for your convenience. Click here to read my full disclosure policy. 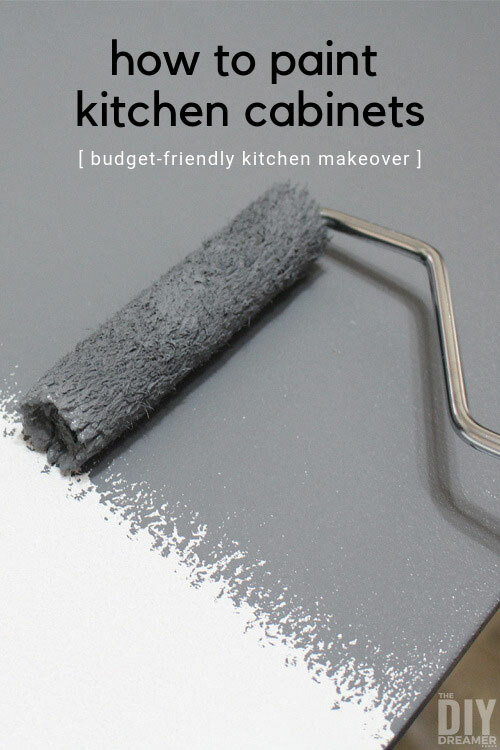 Not sure what color to paint your kitchen cabinets? I shared a great tip on Instagram on how to choose paint colors for your kitchen cabinets. 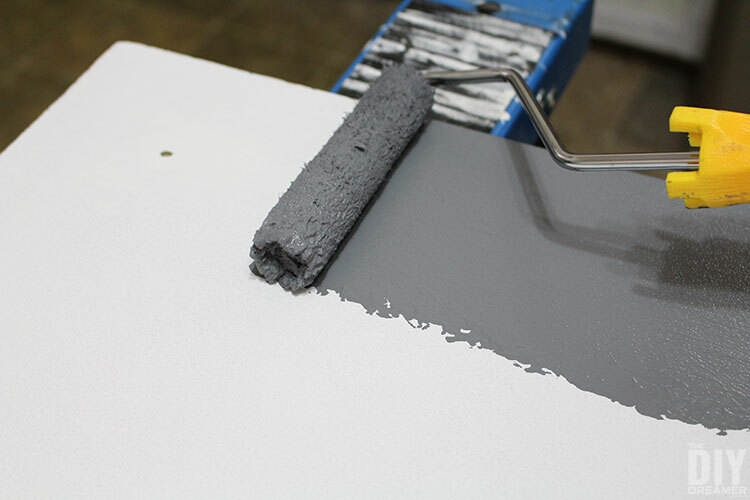 Get a bunch of paint samples and apply the paint on large pieces of cardboard. You can easily play around with the colors this way. You may be surprised how a color looks different from one area to the other. Isn’t that a great idea? 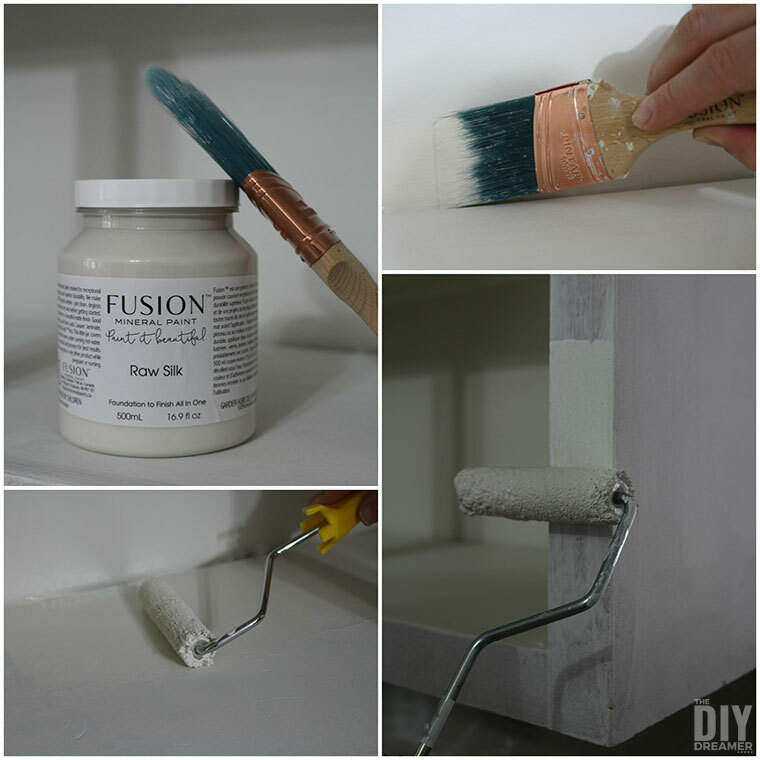 Jennylyn from Fusion Mineral Paint is who suggested that to me, it sure was a game changer for me! Note: We worked in sections. 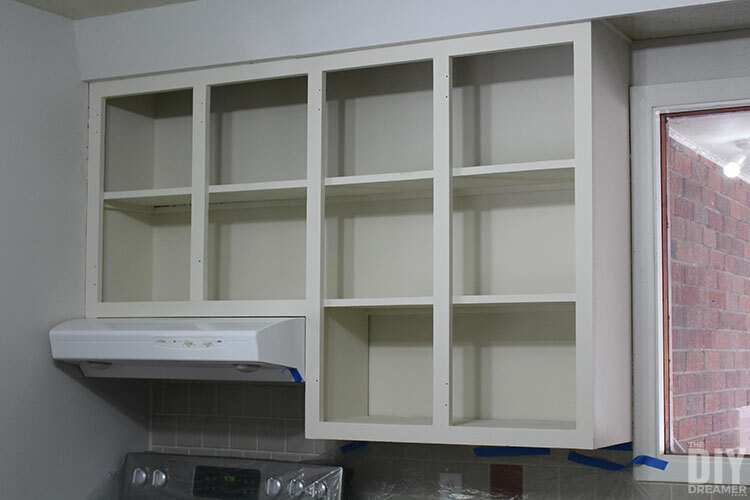 We started by the top cabinets and moved to the bottom cabinets once the top was completely finished. Step 2: We removed the doors from the cabinet frames. 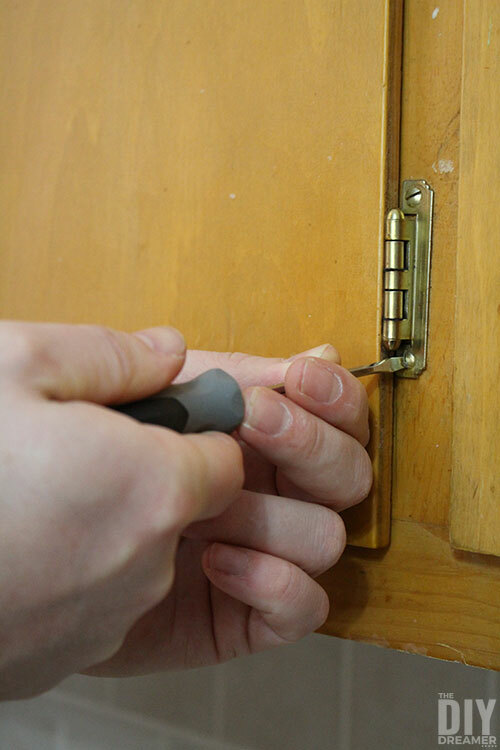 Then we removed the hinges and knobs from the cabinet doors. 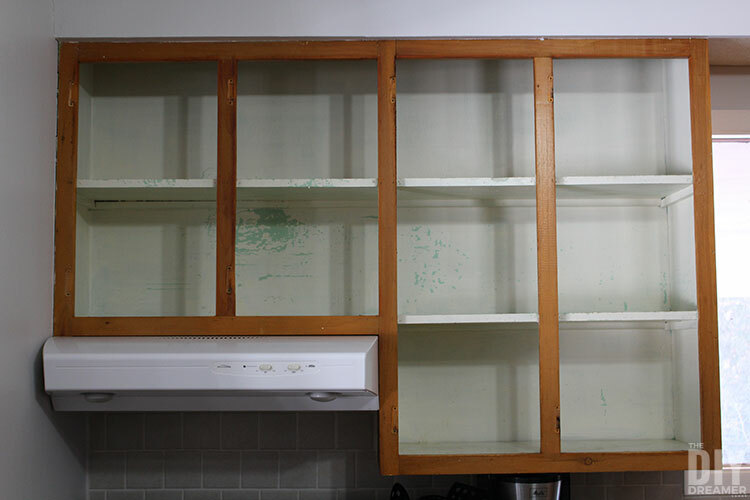 Step 3: We scraped the inside of the cupboards to remove all the loose paint. 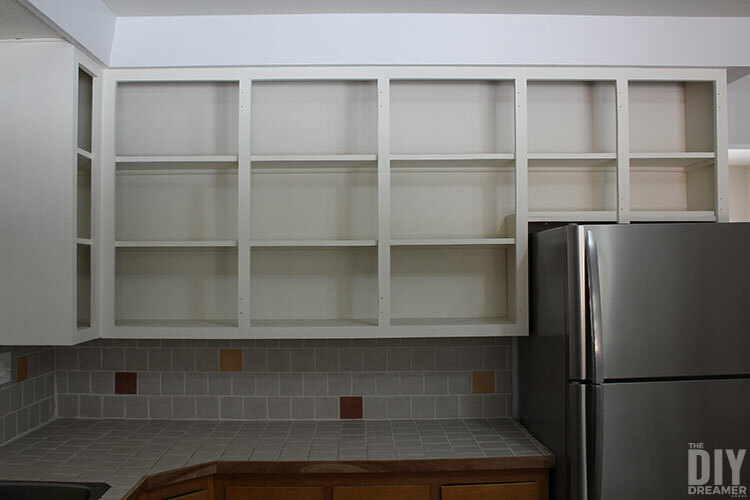 The paint inside the cupboards has been flaking off for years. 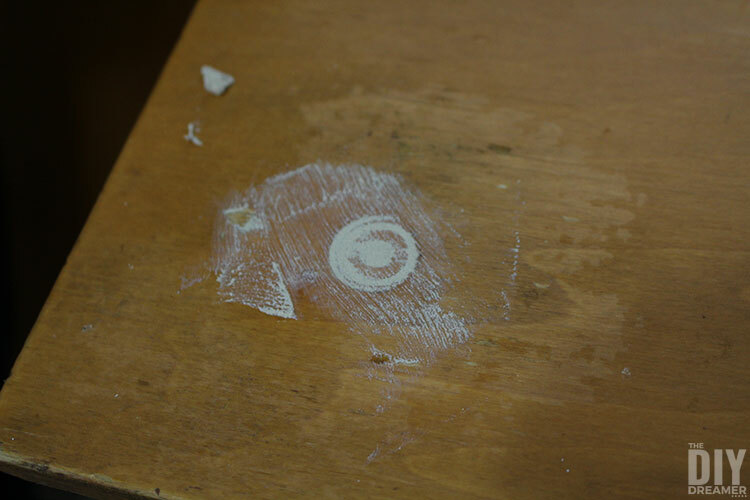 I highly suspect it was because the surface was not properly prepared for paint, which we know is really important! We used a shop-vac to pick up all the paint we were able to scrape off. Step 4: Time to clean the inside of the cabinets and the cabinet doors! 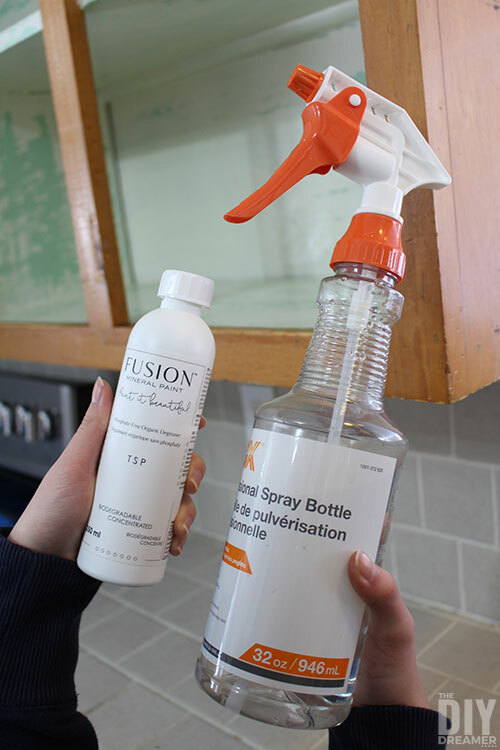 We mixed the Fusion TSP solution with water in a spray bottle. Fusion TSP is a water-based biodegradable degreaser used to thoroughly clean a bare or painted surface prior to applying paint. 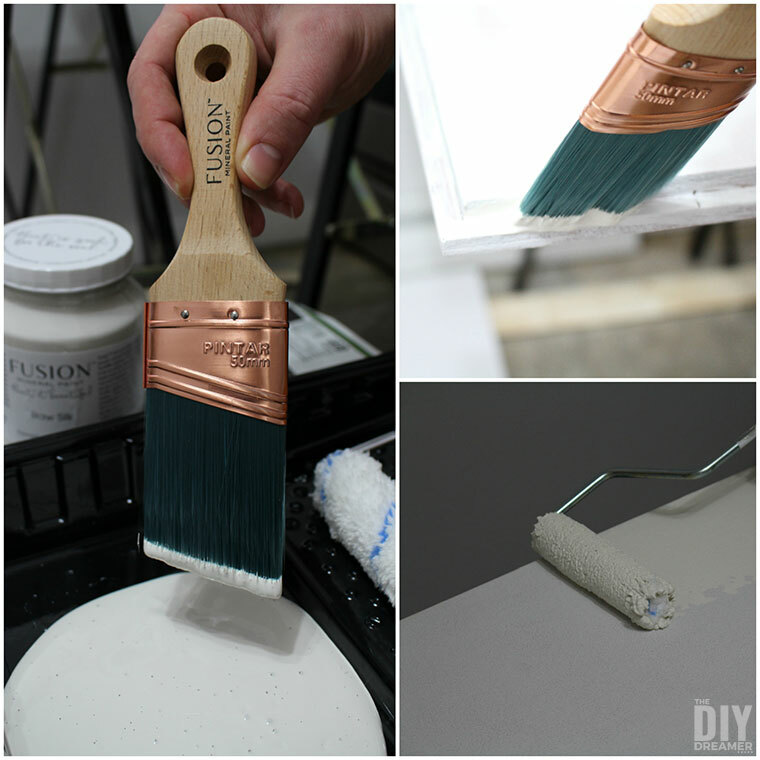 It’s safe to use on all surfaces (wood paint, gypsum, melamine, plastics, metals, and glass. We sprayed the solution on the surfaces we were painting (which is everything hehe) and wiped it away with shop towels. Step 5: After cleaning everything we were able to see where we needed to fix scratches, cracks, dents, holes, and rims from the old knobs. We also had to fill in all the knob holes on the drawers since we were changing to pulls. We fixed all of those things with wood filler. 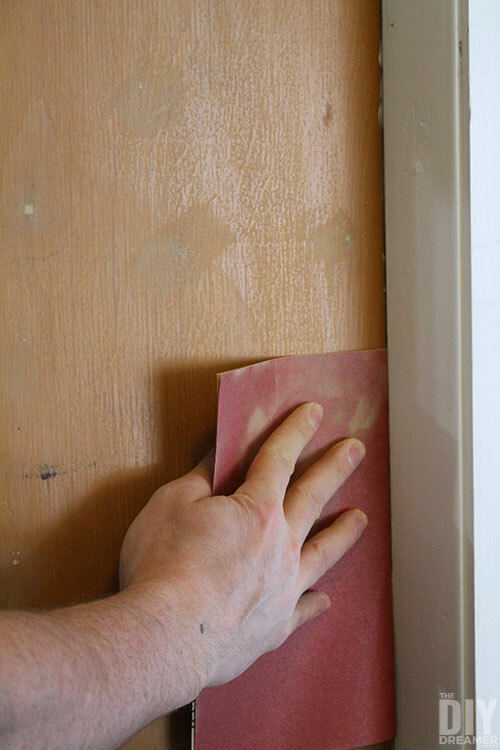 We applied thin layers of wood filler. 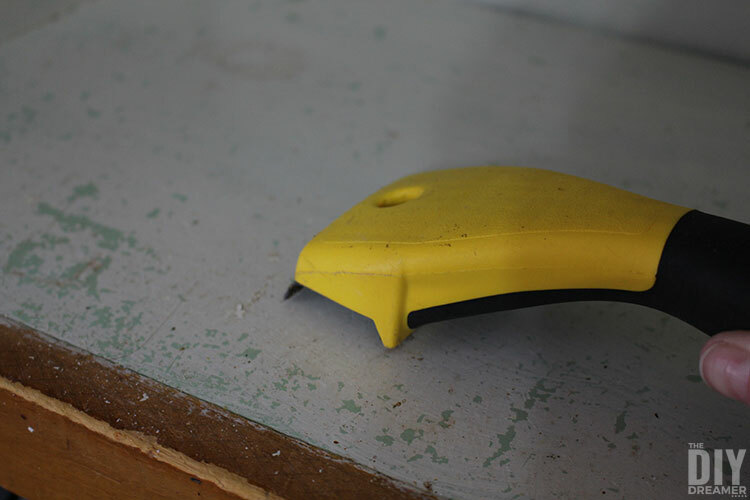 Once dry, we sanded until it was nice and smooth. 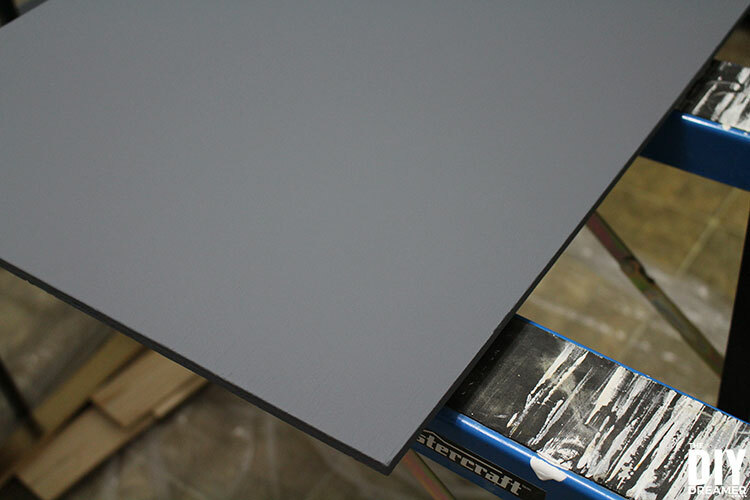 Step 6: Using 220 grit sandpaper, we sanded all the surfaces (inside the cabinets and the cabinet doors). We removed all the dust by wiping it away with shop towels. 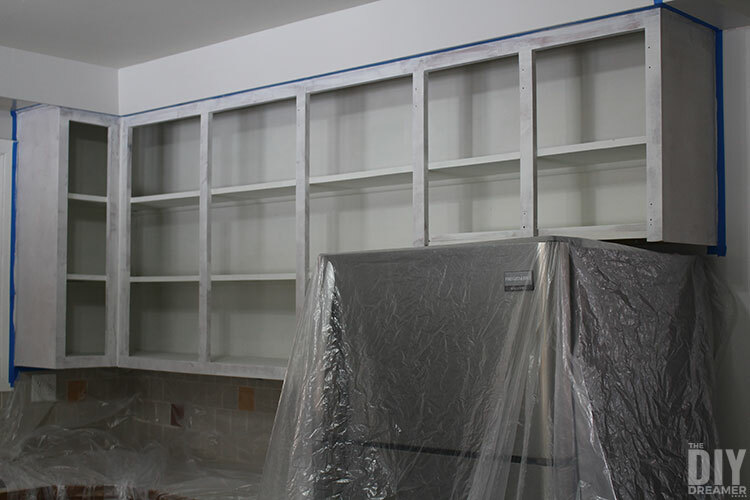 Step 7: To protect the walls and counter we put painter’s tape around the walls surrounding the cabinets. 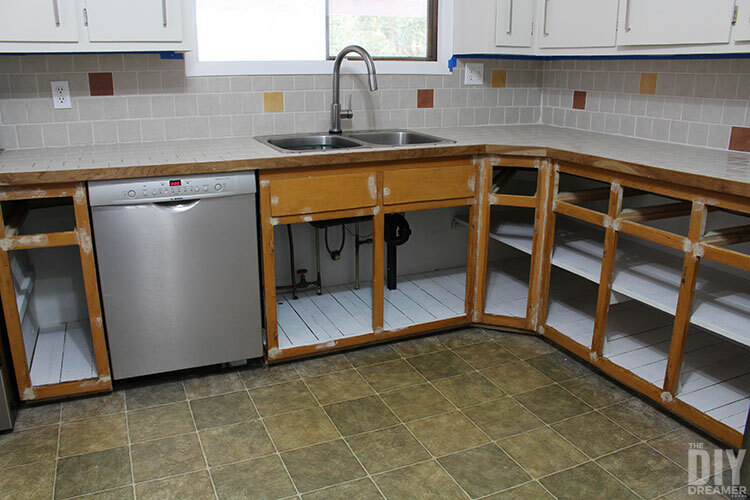 We also put plastic to cover the backsplash, counter, and most importantly the appliances. 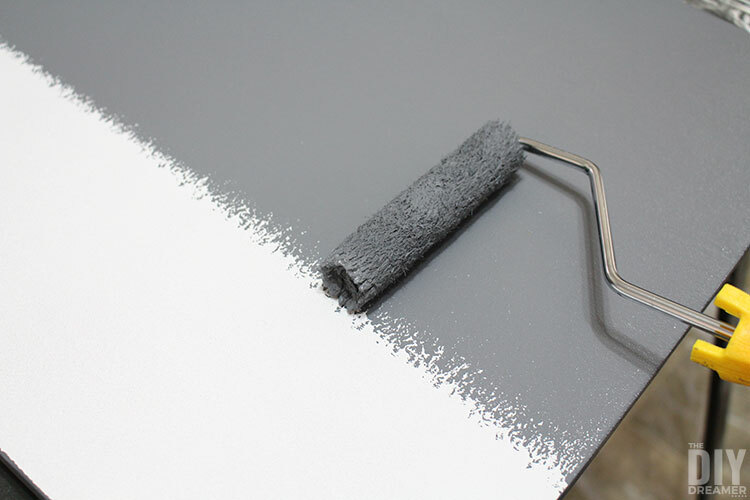 Step 8: We applied B-I-N primer on all the surfaces using a paint brush and a foam roller. Make sure to apply it smoothly. We let it dry 2 hours (as per the directions on the paint can) before applying a second coat. 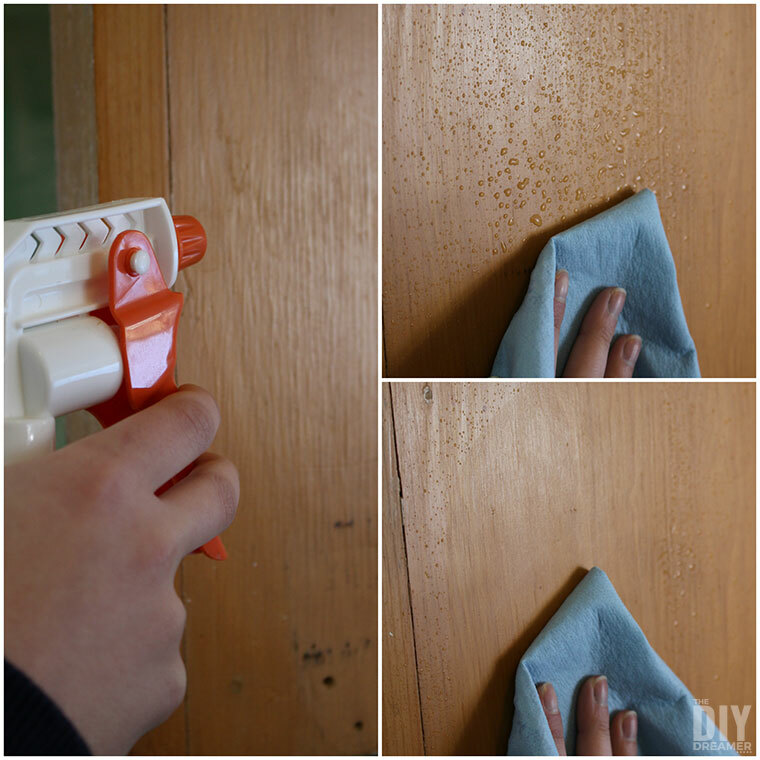 If you need to, you can sand between coats to make sure the surface is nice and smooth. Step 9: Using a combination of a premium quality paint brush and microfiber roller, we applied a paint called Raw Silk from Fusion Mineral Paint inside the cabinets and on the cabinet doors. Oh my goodness do I love the color! Raw Silk is a perfect off white. I really love the texture of the paint, it applies so well, coverage is AMAZING, and it’s self leveling. 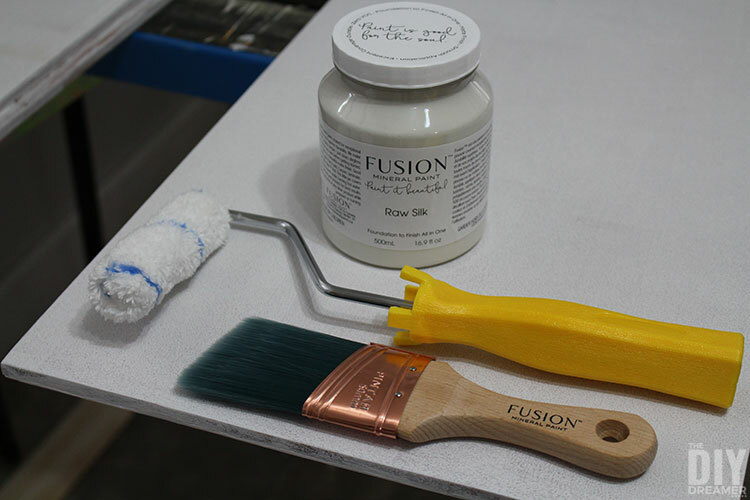 Why are we using Fusion Mineral Paint? Built in top coat. No waxing needed. 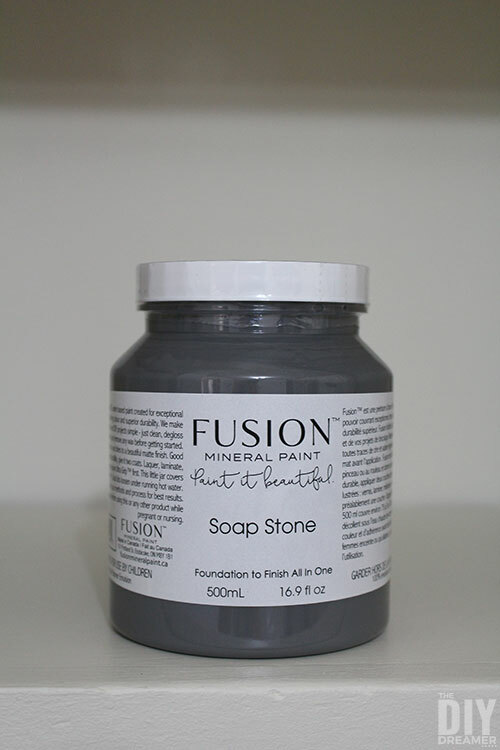 Complete details here: why use Fusion Mineral Paint. 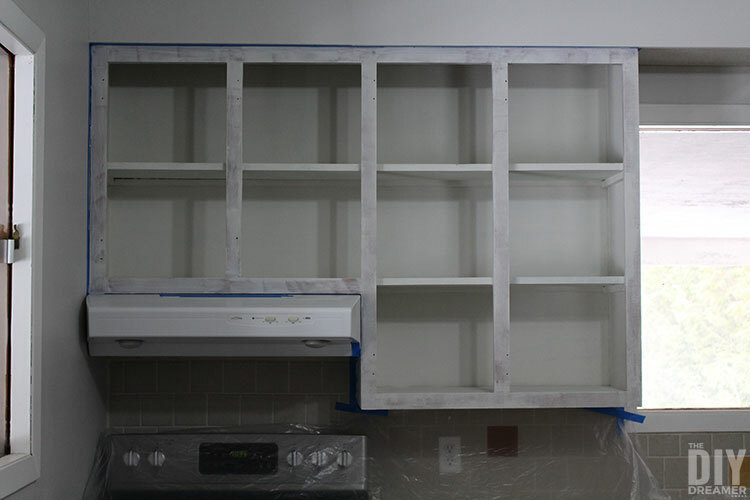 We used the paint brush for all the contouring inside the cabinets. 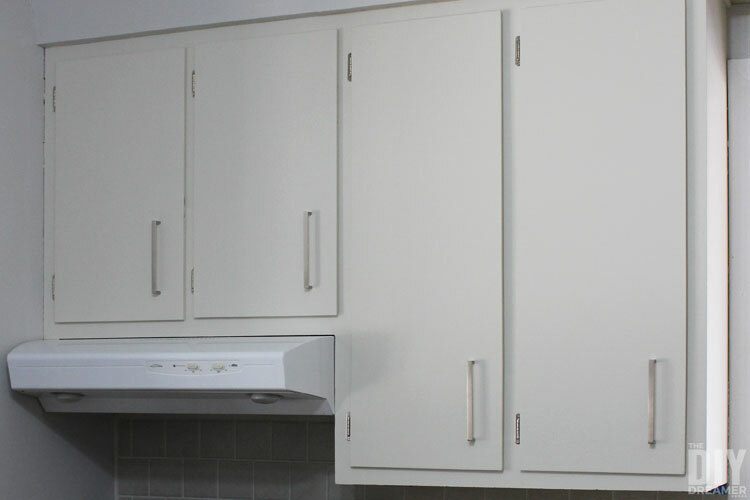 We used the microfiber roller for everything else, including the entire surface of each slab cabinet door. It made the process fast and absolutely beautiful. We made sure to use the paint brush if there were any drips on the sides, but that rarely happened. We painted with the roller using up and down motions, making sure to go straight from one edge to the other. Then we moved the roller over overlapping what was just painted. We let them dry for 4 hours before flipping over the cabinet doors to paint the other side. Then we let them dry another 4 hours. 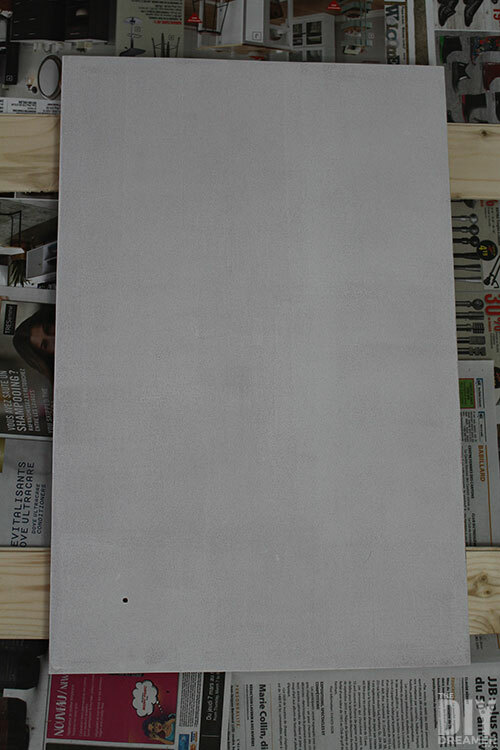 Step 10: We applied a second coat of Raw Silk from Fusion Mineral Paint following the same method as above. Doesn’t it look great already? We are so loving the color!! 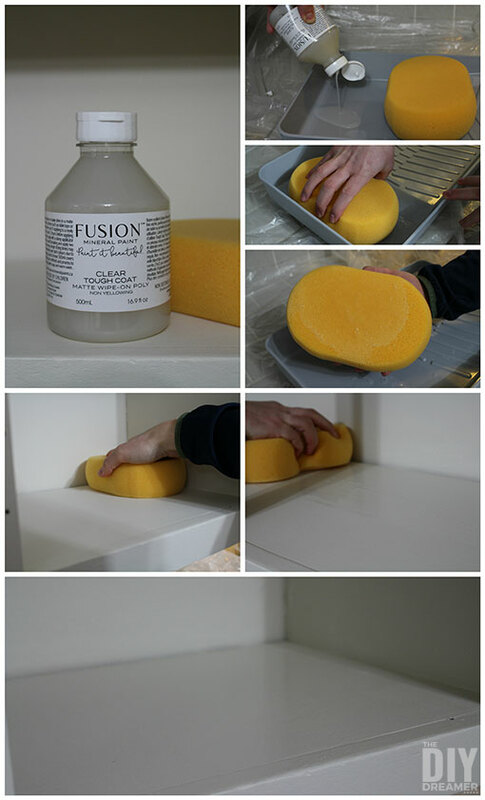 Step 11: (Optional) To add extra durability to our shelves, we applied two coats of Fusion Mineral Paint Tough Coat (4 hours between the coats) with a very fine sponge. Here’s a great video explaining how to apply Fusion’s Tough Coat. We only applied it on the shelves to help protect the shelves from dishes possibly scratching the surface. I absolutely love the silky finish it gave the shelves. Note: Fusion Mineral Tough Coat should only be applied on light colors. 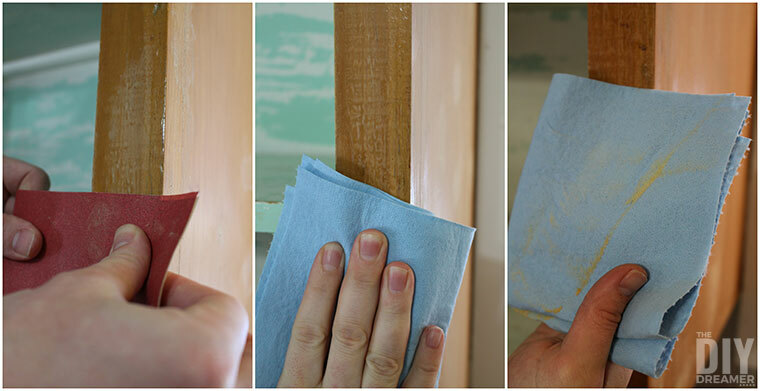 If you want to add extra protection to a dark color, use Stain & Finishing Oil – All in One in Natural. 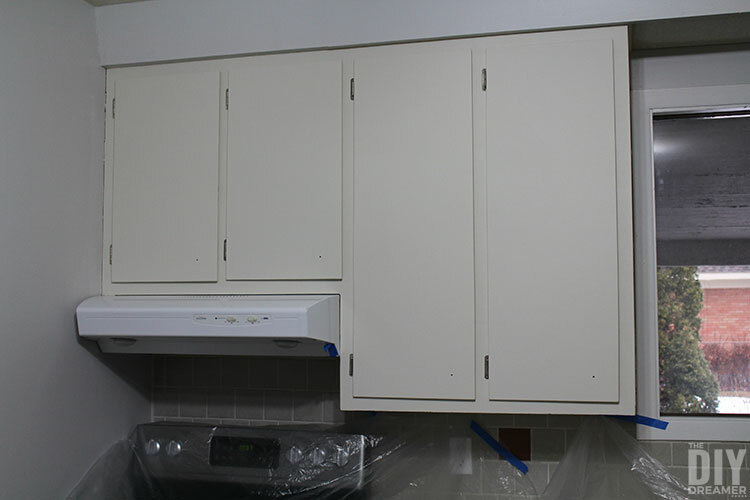 Step 12: Time to hang the top cabinets. 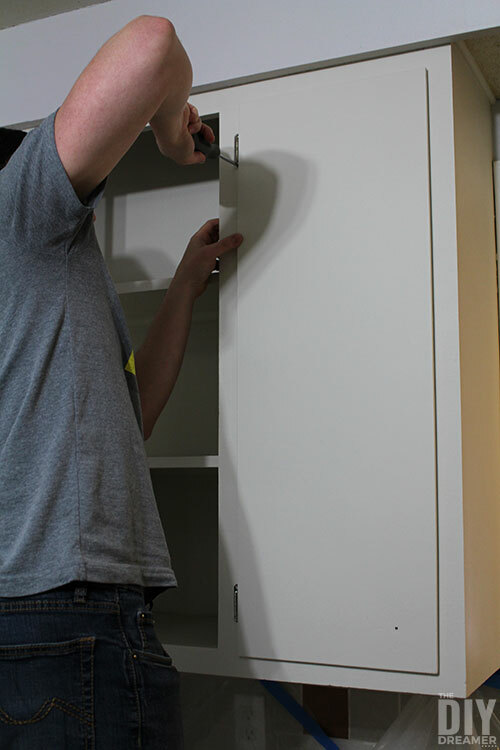 We attached the hinges onto the cabinet doors. We did not purchase new hinges, we just cleaned the hinges we had. We soaked them in hot water with some OxiClean and Borax for about 30 minutes and all the gunk just peeled off. I was surprised to see the hinges were not brass! I guess they were just spray painted or something because they came out silver! YAY! Exactly what we wanted! They came out looking like new! Reusing what we had was a great way to save money. 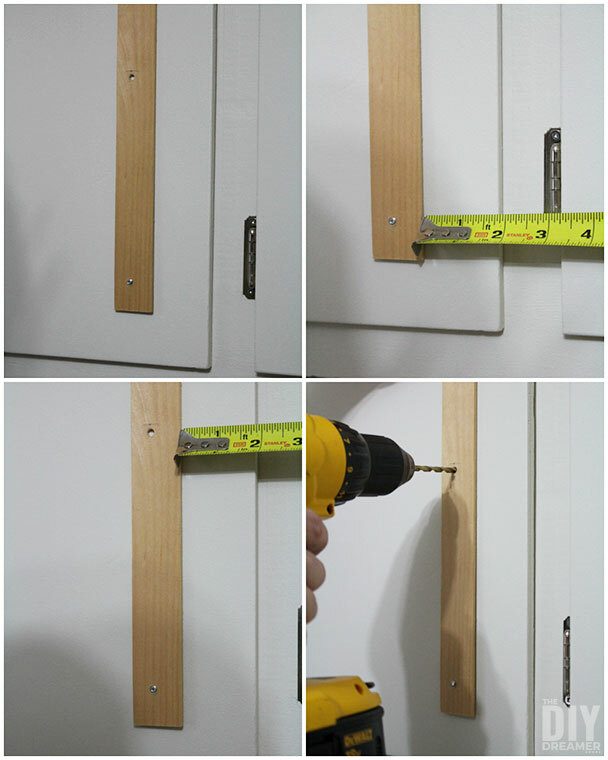 Step 13: We purchased new cabinet pulls for the cabinet doors. We found a model we liked and waited for them to come on special. They often have them at 25% off, so we waited until then to buy them. To install the pulls we made a template so that we could install the pulls quickly. 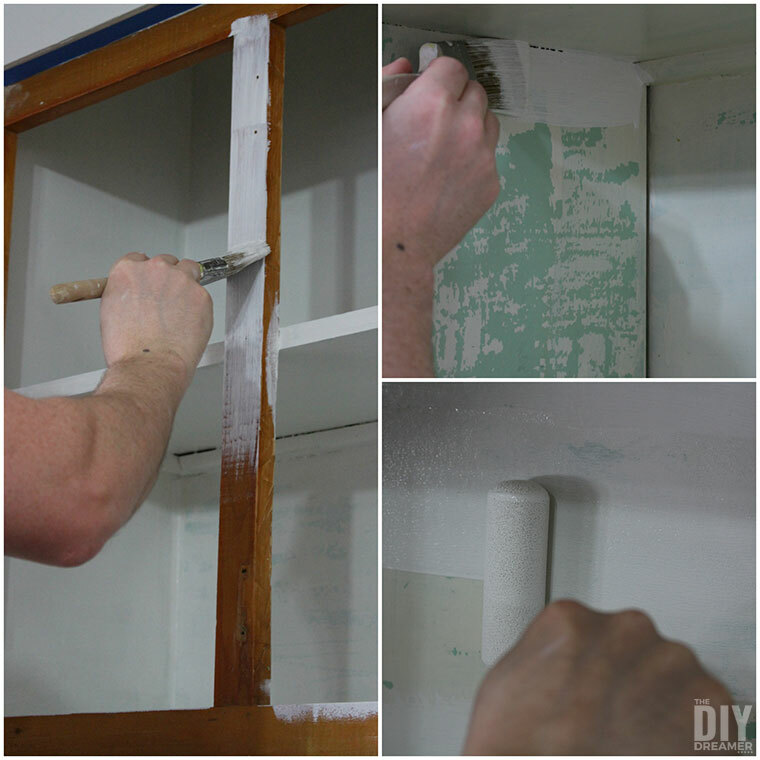 Here’s a great cabinet hardware template tutorial. Step 14: Time to start working on the bottom cabinets and drawers. We repeated the process of steps 1 to 12. 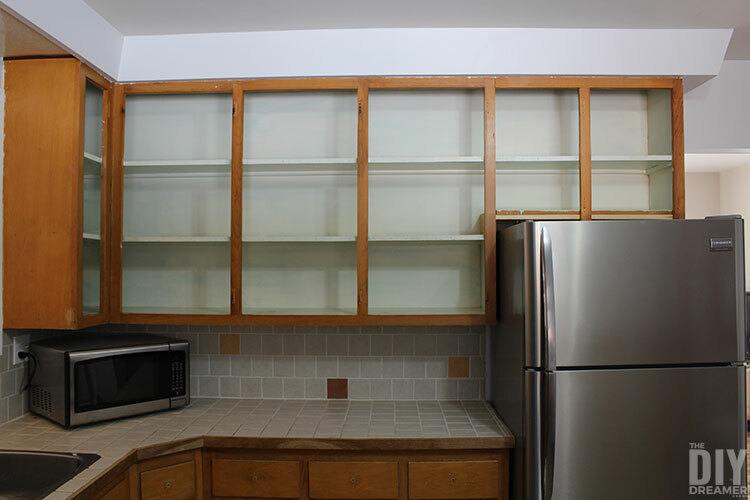 Empty bottom cabinets before cleaning them with TSP. Frame with wood filler, before sanding. Inside of the cabinet primed. Bottom cabinet frame primed. The inside of the cabinet was all painted in Raw Silk and we applied Tough Coat on the shelves too. The only difference was the color we painted the cabinets and the drawers. We painted them in Soap Stone from Fusion Mineral Paint. What a beautiful shade of deep grey. It applies so well and the coverage is just AWESOME. The first coat went on perfectly. Once it dried it didn’t even look like we needed a second coat. Of course we did apply a second coat for that extra layer of protection. Ready to see the cabinets all painted? We just love having color in our kitchen now! It looks so much brighter. 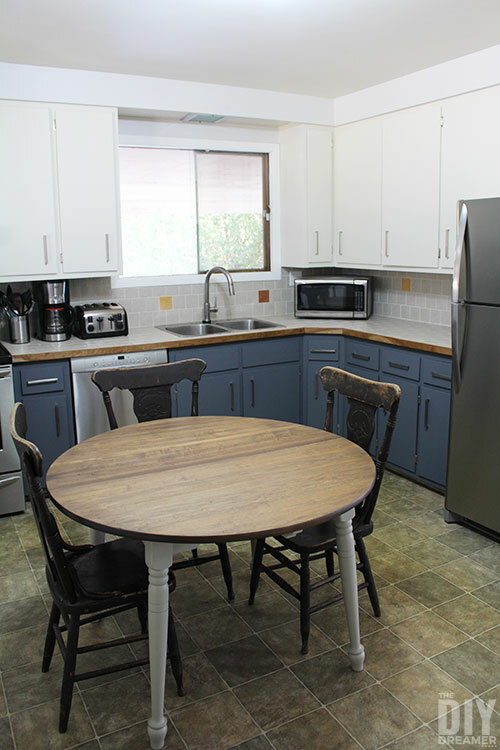 We used a total of 4 pints of Raw Silk paint, ½ pint of Soap Stone paint, and 1.25 of a bottle of Tough Coat to complete this kitchen makeover. I can’t get over how just by painting our kitchen cabinets, it feels like we have a whole new kitchen. I just love it! Of course we have a few more things to do for it to be a complete kitchen makeover, but painting the cabinets is the biggest improvement! 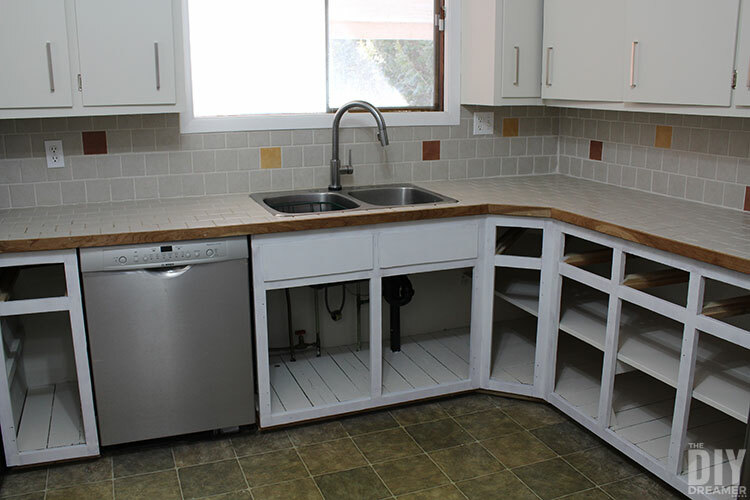 Next week I will share with you two more budget-friendly upgrades we have done to the kitchen. I can’t wait to show you! P.S. 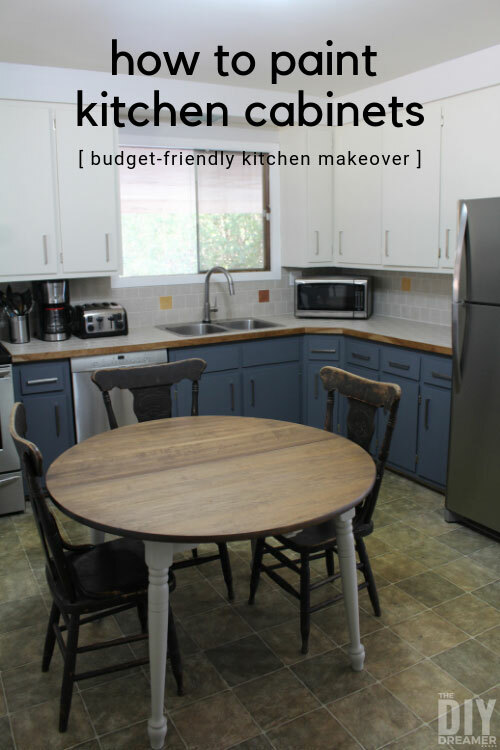 If you loved this budget-friendly kitchen makeover, please PIN IT and share it! Thank you! I really hope you have enjoyed my kitchen makeover! As I mentioned previously, I have a few more kitchen projects in the works! Love this modern look on a dime! The two tone of uppers and lowers is super hip right now. Great job- I feel so inspired! I’ve always wondered about Fusion paints. Those colors look so saturated and stunning! Now I definitely need to try them out! 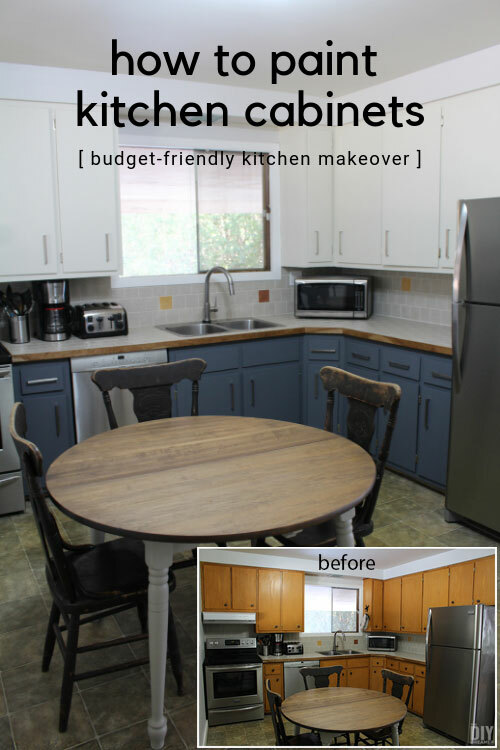 Thank you for sharing this kitchen makeover, it looks 10 times better!! It’s amazing what paint can do and I love the two tones. It’s amazing what a little paint can do! 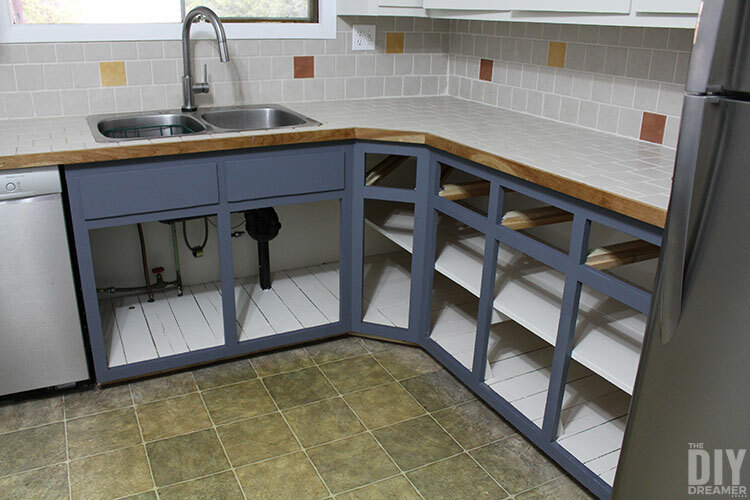 I love the different colors for the top and bottom cabinets – they look great together! Oh My God! This is such an amazing transformation. Love the color combination. What a huge improvement! I love the contrast of the dark bottoms and light tops! Great job!